Although the Packers have been linked to a possible Dez Bryant addition, quarterback Aaron Rodgers doesn’t see a fit, as Rob Demovsky of ESPN.com writes. “Well, we like young receivers, so I’m assuming that’s the way they’re going to keep going,” Rodgers said. “I don’t know why you’d cut Jordy [Nelson] and bring in Dez, but he’s a talented player. He’s going to end up somewhere. If he ends up here, we’ll obviously welcome him with open arms and get him up to speed as quick as possible.” Green Bay drafted three wideouts to team with incumbents Davante Adams, Randall Cobb, and Geronimo Allison, so as Rodgers notes, there’s probably not room for a veteran like Bryant on the club’s roster. The Packers, despite having been loosely connected to Bryant since he was released by the Cowboys, are not currently pursuing the 29-year-old pass-catcher. Linebacker Anthony Barr was not present for the Vikings‘ organized team activities this week, according to Ben Goessling of the Minneapolis Star-Tribune. Under the terms of his fifth-year option, Barr is fully guaranteed a base salary north of $12MM for the 2018 season, but he likely still doesn’t want to place himself in undue injury peril given that he doesn’t have a long-term contract in place. Barr’s fifth-year option doesn’t contain any sort of workout clauses, so he’s not costing himself money by not attending voluntary sessions. As Goessling tweets, Barr was present for a Mike Zimmer football camp at the Vikings’ facility over the weekend, suggesting there is no acrimony in talks with Minnesota. New Packers general manager Brian Gutekunst attempted to hire Ravens scout Milt Hendrickson as his assistant GM earlier this year, but Baltimore and GM Ozzie Newsome denied the request, as Bob McGinn of BobMcGinnFootball.com reports (Twitter link). Hendrickson has been with the Ravens since 2006, writes Zach Kruse of PackersWire.com, who adds Hendrickson worked alongside Gutekunst at the University of Wisconsin-La Crosse. Hendrickson still lives in La Crosse, per McGinn, and could join the Packers’ staff in 2019. 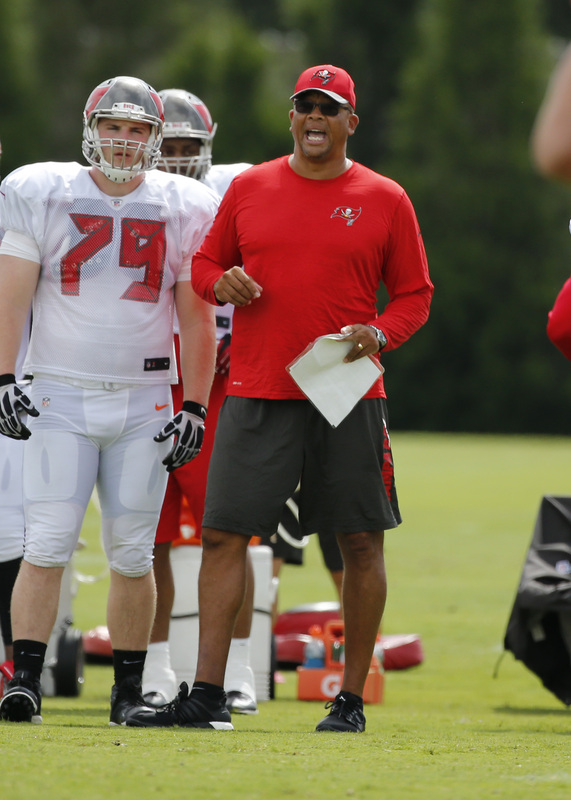 Former Buccaneers defensive line coach Jay Hayes will serve as a Packers defensive consultant through at least training camp, per Greg Auman of the Tampa Bay Times (Twitter links). While Hayes’ assignment currently only lasts through training, it sound as though there may be an opportunity for Hayes to stick around further. Hayes, who was fired by Tampa Bay in Feburary, previously served on the Bengals’ coaching staff for 13 years. The Buccaneers, despite some rumblings that they would fire head coach Dirk Koetter at the end of the 2017 campaign, have actually kept their entire coaching staff intact. Until now. Jenna Laine of ESPN.com reports that Tampa Bay has fired defensive line coach Jay Hayes, which comes over a month after Koetter said he did not anticipate making any changes to his staff. It is unclear why he opted to reverse course at this point, but Hayes’ unit certainly left much to be desired during his two-year tenure with the club. Over the 2016-17 seasons, the Bucs’ defense registered 60 sacks, tied for 27th in the NFL, and in 2017, the team finished with 22 sacks, last in the league. Tampa Bay yielded 378.1 yards per game to opposing offenses in 2017, which was also last in the league. Of course, the defensive line is not entirely to blame for that performance, especially given that Hayes’ group was hit by several significant injuries in 2017. But no one can really fault the Bucs for making this move, even though the timing of it is somewhat curious. The only other change the team made to its coaching staff this offseason has been promoting Skyler Fulton to wide receivers coach. Hayes previously served as the Bengals’ DL coach for 13 seasons and was credited for the development of players like Geno Atkins, Michael Johnson, and Carlos Dunlap. New Browns head coach Hue Jackson confirmed earlier today that he’ll be retaining special teams coordinator Chris Tabor, but there have been announcements yet on Cleveland’s other coordinators. While Ray Horton and Leslie Frazier are among the names that have been linked to the Browns’ defensive coordinator job, one possible candidate worth keeping an eye on is former Dolphins DC Kevin Coyle, says Jason La Canfora of CBSSports.com (Twitter links). Alex Marvez of FOX Sports reported on Wednesday that Coyle was expected to replace Vance Joseph as the Bengals‘ defensive backs coach, but there are hints he may join Jackson in Cleveland instead. Marvez tweets today that Cincinnati is interviewing 49ers defensive backs coach Tim Lewis for the same position, and Albert Breer of NFL Network tweets that the Bengals are looking at Michigan secondary coach Greg Jackson for that job, so it certainly doesn’t seem like there’s a deal in place between the Bengals and Coyle. As we keep an eye on that situation, let’s check in on some other coaching updates from around the NFL…. On the other side of the ball for the Browns, a former Colts offensive coordinator may be a candidate for the job in Cleveland. As first reported by Tony Grossi of ESPNCleveland.com (Twitter link), Pep Hamilton met today with Hue Jackson. Last week, a report suggested that the Buccaneers had turned down a Chargers interview request for defensive line coach Joe Cullen. 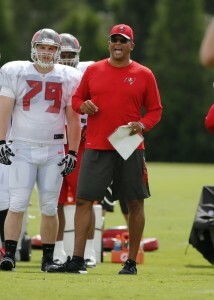 However, after hiring Mike Smith as their new defensive coordinator, the Bucs are willing to let Cullen go. Cullen will join the Ravens as their defensive line coach, tweets Mike Garafolo of FOX Sports. To replace Cullen, the Buccaneers are hiring Jay Hayes from the Bengals, per Marvez (all Twitter links). Tampa Bay is also hiring Titans special teams coach Nate Kaczor and former Dolphins linebackers coach Mark Duffner for those same positions. Since the Titans are the last team without a head coach, they should take their time to make a decision, perhaps interviewing potential candidates from eliminated playoff teams after this weekend’s games, writes Paul Kuharsky of ESPN.com. Former Giants wide receivers coach Sean Ryan will head to Houston to become the Texans‘ WRs coach, tweets Ian Rapoport of NFL.com.